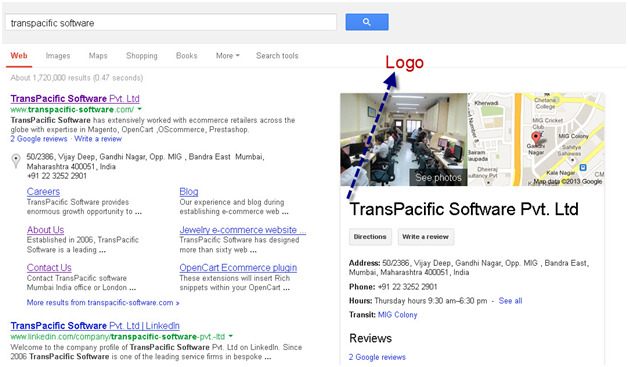 Getting your logo in Google Knowledge Graph through semantic mark-ups | TransPacific Software Pvt. Ltd. Recently Google announced its support to schema.org markup for organization logos, a way to connect your site with an iconic image. A great way to increase your brand awareness. What it means is: On your home page you can mark-up your company logo with schema.org organization markup . The logo will be displayed in Google “Knowledge Graph” or in Google’s search results (it’s at the discretion of Google as to where they will display the logo). After uploading the page on live site; test the page in Google’s rich snippet tool to see if the markup is correctly picked up. If it is correctly embed you will find rich snippet tool properly reading the data under schema.org organization schema (as shown in below image). Re-submit your site map through Google webmaster for re-indexing. It may up to three to four weeks before Google picks up the mark-up.